Applesauce! Look — my first story about Pip and her friends has a pos-i-lutely wonderful review from the inspirational and creative Robbie Cheadle! I thought I would add it to Jazz Age Wednesdays, but I couldn’t wait. Robbie’s remark that Pip is “a suitable role model or female readers in our modern world of obsessions with food and extreme thinness.” Means a lot to me. Be sure to click over to Robbie’s Inspiration and check out her wonderful blog. 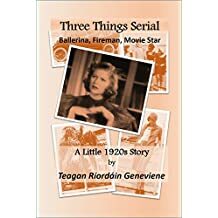 Posted on June 5, 2018 by Teagan R. Geneviene •	This entry was posted in Jazz Age Wednesdays, Teagan's Books, Three Things (Parent) and tagged 1920's, Cozy Mystery, Jazz Age, Pantser, Reviews, Roaring Twenties, Robbie Cheadle, Robbie's Inspiration, Three Things Serial. Bookmark the permalink.